I just want to address the fact that I am fully aware that I look like an absolute creeper and a half in these photos, but the colours were too good not to use them! I also somehow managed to bugger up the quality of the pictures during the editing process, I promise i’ll get better at this one day.. 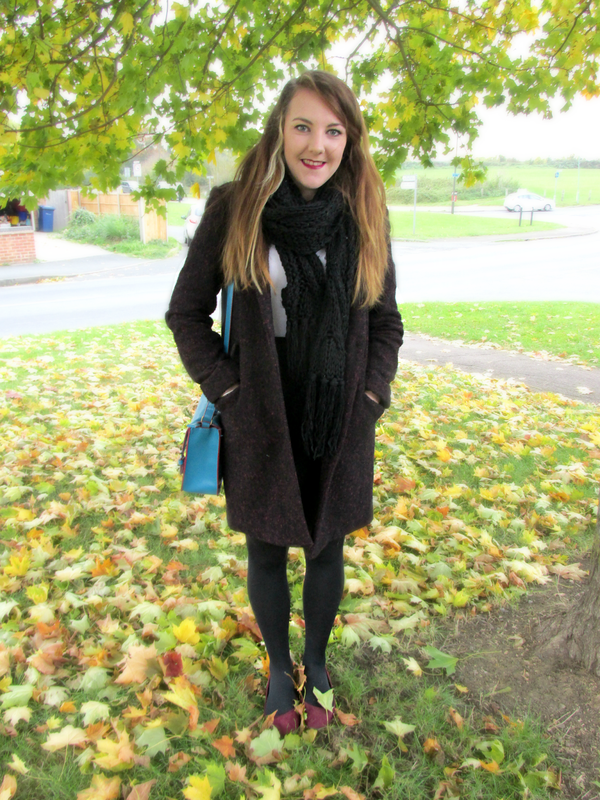 If you follow me on Instagram, you’ll know that I picked up this absolute bargain of a coat in a charity shop on the Tewkesbury high street for just £4.50.. and it’s brand new, from Next! How lucky am I?! It’s really snug and warm and fits like an absolute dream! My mum’s recently had a clear out of wardrobe and she asked me to have a look through the bags that she was going to drop off at the charity shop in case there was anything in there that tickled my fancy. So of course I had to have a rummage and I pulled out this MASSIVE black knitted scarf. I’m not joking, it’s over 6ft long! I can wrap it around my neck two or three times and it’s still dangling over my tummy! The weather here has gotten super cold over the last week or so, so this little gem has been keeping me toasty! Not that you can really see in these photos but my top is a little white, ribbed, cropped tee from Primark. I have two exactly the same because well, they were £1 so I couldn’t just take one, that would have been rude! They’re so handy and go with literally everything! I’m trying to get my hands on a pinafore dress at the moment and I know they’ll be be perfect for under that too. My bracelet is my current favourite accessory. Two of my absolutely amazing buddies, Kathy and Sammy, gifted it to me when I left Gibraltar last month and it only really leaves my wrist whilst I sleep and shower! It’s from a brand called Alex + Ani and it has a lotus flower on the charm and it’s safe to say that i’m obsessed with it. The Alex + Ani bracelets are adjustable in a really clever way, meaning that the fit everyone and you don’t have to fanny about with a tiny little clasp when you’re trying to get it on! 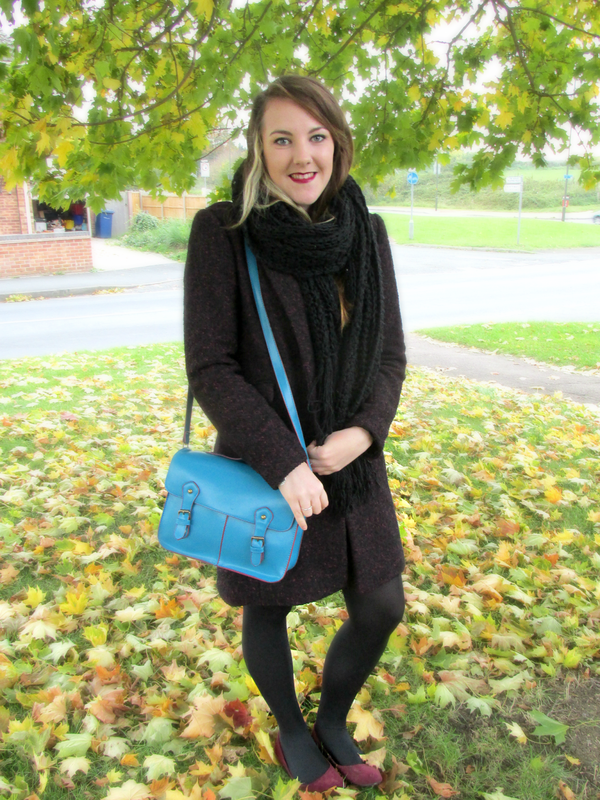 Last but not least, check out my new little handbag! 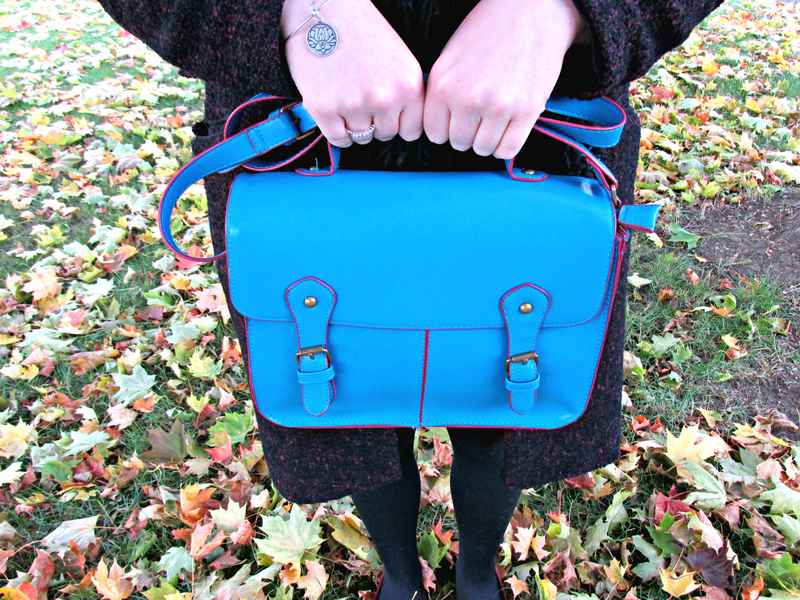 It’s an adorable, bright blue, miniature satchel with deep/dark pink and gold detailing. It’s just the right size to fit everything I need in it! Mum and I spotted it in the British Heart Foundation charity shop in Tewkesbury but I decided to leave it and think on it a little, but then whilst we were visiting Colwyn Bay, we saw it in there too, so mum kindly treated me to it! If I can remember correctly, it was £12.99 full price but down to £10 on offer from their “brand new” section.